Visit or stay at Nan Tien Temple, the largest Buddhist Temple in the Southern Hemisphere. Nan Tien is very different from most tourist attractions because there is so much to offer: the visual delights of grandeur architecture, art and culture including unique exhibitions and festivals, Buddhist festivals, vegetarian culinary delights, educational and healthy lifestyle classes and retreats, accommodation, top class conference and auditorium facilities. There is also the spiritual and religious experience that is unforgettable and even life changing for some. 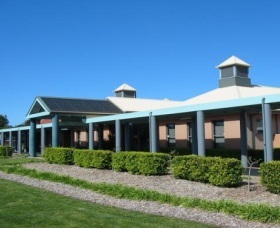 Pilgrim Lodge, Wollongong's most unique accommodation setting is a 100 room facility, which is open all year round and located in the grounds of the Temple. The Lodge overlooks the lotus pond, the peaceful Temple, splendid gardens, the beautiful rolling hills and famous escarpment of the Illawarra. Situated in Berkeley, which is only 10 minutes south of Wollongong City and famous beaches. Come and be inspired. NSW Air provides Scenic Joy Flights from Albion Park Regional airport. The Bridge to Beach flight flies north to the Seacliff Bridge taking in the beautiful coastal views and northern beaches before returning south via Wollongong, Shellharbour and Kiama and back to the airport. Flights can also be extended to fly north and over Sydney Harbour, taking in views of the Sydney Harbour Bridge and the Opera House, or south down to the Shoalhaven via the coast and on to Jervis Bay. 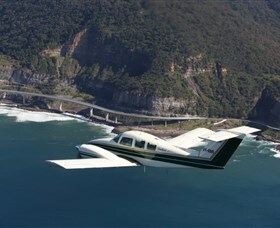 NSW Air fly seven days and can accommodate flights one to nine people at a time. They offer Trial Instructional Flights where the more adventurous can take the controls and fly. For more information please contact the operator or visit the website. The Tongarra Bicentennial Museum was opened in 1988. 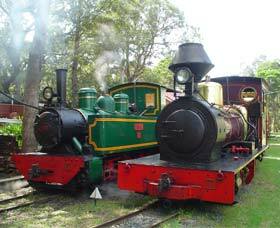 The Museum collection includes artefacts significant to the history of Shellharbour, and those that tell stories about the people and places of past and present. 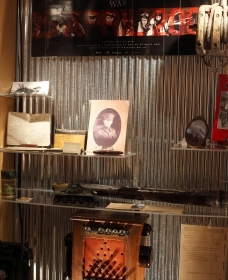 It features pioneering and historical exhibits such as the Victorian Automatic Sock Knitting Machine and Handmade Patchwork Quilt; a large collection of early maps and panoramic photographs of the Shellharbour Local Government Area and a bronze bust of Caroline Chisholm, who is known as 'The Immigrants' Friend', who helped to settle families in Shellharbour in the 1840s. JPD Surf - Stand Up Paddle Boarding brings physical and mental wellbeing by getting outdoors in the fresh air, having fun, spending time with friends and family, and being active. They want to get as many people as possible out there discovering and enjoying both the sport and the beautiful coastline and waterways. 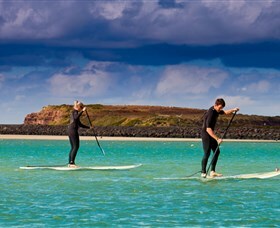 JPD Surf is a fully accredited ASI Stand Up Paddle School, providing lessons and board hire. Lessons are by appointment only with the weather favouring morning sessions at Boat Harbour, Shellharbour Village; Little Lake, Elliot Park or Headland Parade at Barrack Point; Sailing Club, Deakin Reserve or The Boulevarde at Oak Flats. They are open seven days a week by appointment. Contact them to make a booking! The Links is unique in that it is not your usual 'Golf Club' - the golf course is in fact attached to a licensed hotel. 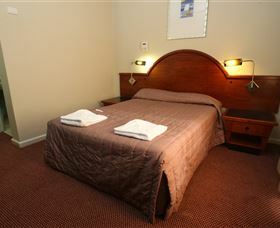 The Links Hotel is a family friendly, modern and stylish establishment with sweeping views over the golf course. Golfers will also love the fully stocked golf shop with their friendly, professional staff. Macquarie Pass National Park is part of the Illawarra escarpment south of Sydney and provides some magnificent scenery and displays untouched rainforest, covering 1,064 hectares. Visitors can view nature at its best, beautiful satin bowerbirds and lyre birds as well as swamp wallabies and wombats. It contains a diverse range of habitats and wildlife including several rare and threatened plant and animal species. The steep sandstone ridges and gullies are topped by cliffs, and the park supports heathland, woodland, tall open forest and significant rainforest areas. 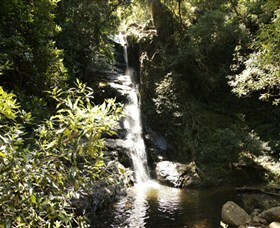 It is an excellent bushwalking and picnicking area, with spectacular scenery and waterfalls. Starting at the base of Macquarie Pass at the picnic area, you can walk to the Cascades Waterfall (two kilometres return). Southern Biplane Adventures is an exciting organisation that gives you the opportunity to create your ultimate aviation adventure. Based at Illawarra regional airport, Southern Biplane Adventures offers the premier biplane experience in the greater Sydney region. If you're after a scenic flight over Sydney's pristine south coast or have a desire for an adrenaline rushed aerobatic stunt flight, Southern Biplane Adventures is the right place to land! 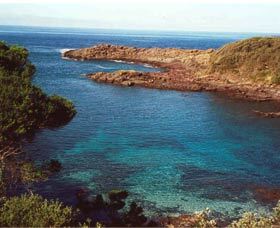 Bushrangers Bay is an aquatic reserve located at the eastern end of Bass Point Reserve. 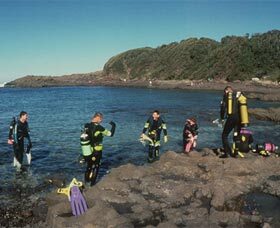 The bay is well known as a top diving and snorkelling location due to its sheltered position. The bay is three hectares in size extending from the mean high water mark to the seabed on the outer boundary. As this is an aquatic reserve for plant and animal species, divers are requested to take care when touching soft corals as they break off easily. Within the reserve you cannot fish or destroy marine life. You are not permitted to collect dead or alive marine organisms, this includes empty shells. One of the most striking features within the reserve is a cliff shaped like an amphitheatre in 10 metres of water, the cliffs are six metres high with hundreds of small cavities which are home to sea urchins and tropical fish. 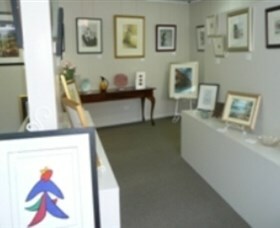 Kiama Art Gallery specialises in modern European and Australian art, and is open by appointment only. The Gallery collection has a range of beautiful original works and prints, lithographs, etchings, pochoirs and reproductions (both framed and unframed) by well known international, national and local artists, as well as ceramic and glass giftware. Kiama Art Gallery is a relaxed gallery, which presents art works from the early 20th century through to more contemporary styles. Visit their website for more information on their warm and welcoming gallery in Kiama, or contact Andrea Hope to make an appointment to view the works in her home based gallery. Andrea can also give advice and assistance on what's happening in the local art scene. 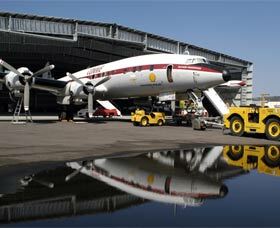 *** The Museum is temporarily closed until October 2013 due to internal hangar works. *** Step back in time and immerse yourself in the life of Australia's aviation history and view some of the most amazing historic aircraft. The HARS staff are always keen to share their passion for historical aircraft and are on hand to answer any questions. They are sure to provide you with an insight into the glory days when these aircraft ruled the skies. On display at the hangar is the world famous "Connie" Lockhead Super Constellation, the airliner of the 1950s that conquered the world. Get close up and personal with two Neptune Bombers. Have your photo taken with "Felix" who proudly represents the Black Cat Catalina Squadron of the RAAF. Venture aboard the flying troops carriers of World War II, the C47 Dakota. 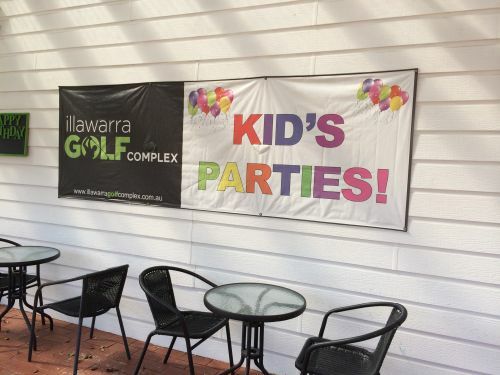 Illawarra Golf Complex has a 30 bay golf driving range, five undercover, and an 18 hole outdoor putt putt with water features and obstacles. The fully stocked Pro Shop stocks all major brands including Ping, Callaway, Titleist, Taylormade, Srixon, Cleveland, Adidas and Footjoy. Two golf professionals are available for lessons and fully catered children's birthday parties and adult corporate days. Owned and operated by PGA Golf Professional, John Hufton. 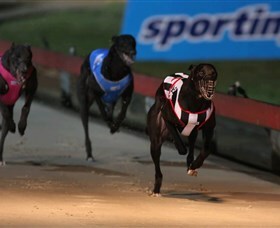 The world famous Dapto Dogs provides a family friendly event every Thursday night. Come and watch up close greyhound racing at its best. Club features include, dining and canteen facilities, a modern bar and tote area, on course bookmakers and TAB facilities and a covered grandstand. For a family friendly night out, head on down to Dapto Dogs. Blackbutt Forest is a 250 hectare reserve and is the last remaining viable remnant of coastal plain forest in the Illawarra region. There are extensive picnic tables and electric barbecue facilities located at strategic points throughout the reserve; amenity blocks and fully equipped children's play ground. Blackbutt has wonderful walking tracks for all ages and a cross country course great for running and cycling. There is a fitness circuit which includes climbing frames, chin-up bars and sit-up benches. An outdoor amphitheatre is located within the reserve with seating for up to 400 people which makes it great for weddings, entertainment and events. While dominated by the tall Blackbutt trees, many other varieties of trees abound including red gum, stringy bark, grey box, coast white box. The trails offer panoramic views of Lake Illawarra, Macquarie Pass, Illawarra Escarpment and Saddleback Mountain. 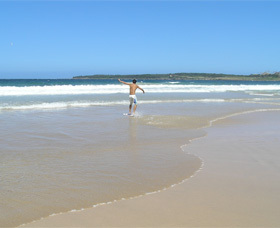 Minnamurra Beach also referred to as 'Mystics' is a favourite with the locals. Mystics Beach stretches from the rocky headland towards the volcanic outcrop known as Stack Island (aka Rangoon Island). This stretch of beach forms a sand spit, behind which is the estuary of Minnamurra River. 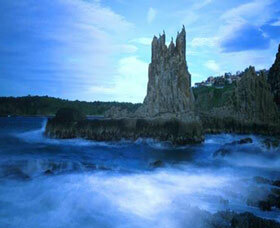 The natural setting features small areas of vegetation with a view out to stunning Stack island. Day visits are popular with people coming for the scenery, surfing, BBQ and picnics. Mystics Beach forms part of the National Surfing Reserve at Killalea State Park and is a popular well known location for surfing. The swell from the south make good left breaking off the point over shallow sand a rock bottom, holding plenty of swell. Bass Point Reserve is a 72 hectares coastal jewel, located just south of Shellharbour Village and contains one of the few littoral rainforest areas in the Illawarra. 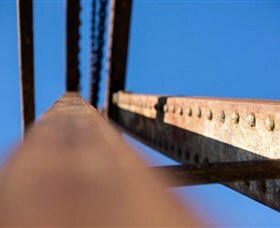 The reserve is listed on the register of the Australian Heritage Commission and is recognised as one of the most important archaeological sites on the NSW coast. 17,000 years before the Egyptians built the pyramids the Aboriginal people were using Bass Point as a regular campsite. A self guided indigenous walk is on site with plaques highlighting detailed information. Bass Point in May 1943 - the American merchant ship 'Cities Services Boston' sank off Bass Point and although no sailors' lives were lost, four Australian soldiers who went to the aid of the ship's crew were drowned. An annual service is held. Bass Point has great fishing and is a well known diving location. A boat ramp and public amenities are also available. Click walk learn is owned and run by Sydney based professional photographer, Christine Bernasconi - who loves photography! Want to learn more about your camera and take your photography to the next level? You can choose to tour The Rocks, Darling Harbour, Sydney by night, or a Sydney full day tour. You will receive personal, easy to understand photography tuition and information relevant to you camera (yes, she studies the workings of your camera). A detailed photography eBook will be emailed to you before the tour. You will learn all about aperture, shutter speed, ISO, composition, depth of field and creative techniques, lots of photography tips, and anything else you want to know about photography. This will all be explained 'as you go' and you will take photos using each new technique before moving onto the next level. You'll be shooting like a pro in no time! South Coast Safaris provide canoe and kayak adventures on spectacular waterways. The half day Minnamurra River package is perfect for those seeking a taste of the outdoors. This trip is complete with a sumptuous riverside lunch. Alternatively, your group may prefer an overnight expedition on the Nepean River where you can immerse yourself in spectacular scenery and be seduced by the ever changing natural environment. Small to large groups are catered for, perfect for corporate team building events, bucks or hens parties, schools, or for any occasion. Canoe and Kayak Adventures friendly and confident staff ensure your safety and a good time by all is paramount to their business. The Greenvalleys Mountain Bike Park is a new mountain bike facility located conveniently in the Shellharbour Local Government Area on the Illawarra Highway at Tongarra, Shellharbour (not far from Macquarie Pass). The park provides a great mountain bike facility that has hosted major events with more events due to be held over the coming months. There is no better way of experiencing the picturesque views of this beautiful region than in a Gyrocopter! The Illawarra, South Coast and Southern Highlands of NSW hide a treasure trove of unique, rugged, natural beauty waiting to be discovered. From spectacular hidden valleys and breath taking waterfalls, to arguably the most pristine coastline you will ever see, you are invited on board for the experience of a lifetime. Experience the sensation of flight in a tandem new age Auto Gyrocopter MTO3, the motorbike of the sky with an experienced pilot to guide you. They have put together some terrific scenic flight packages including the magical '7 Mile' Scenic Flight or the 'Seacliff Bridge' Flight, or they are happy to customise a tour for you. Par-Tee Virtual Golf and licensed bar/cafe offers six TruGolf Simulators loaded with the latest TruTrac E6 software and over 83 world renowned courses such as Pebble Beach, St.Andrew's and Royal Melbourne just to name a few. TruTrac technology is a combination of infrared sensors and microphones with dynamic graphics and 3D imagery. The post shot analyser gives you easy to read feedback and provides you with both club head data as well as ball statistics. Play day and night, no matter the weather and with over 36 modes of play, your golfing experience is a different challenge every time. Sydney Microlight Centre is Sydney's closest approved microlight training facility. Located at Illawarra Regional Airport, Albion Park Rail, just over an hour's drive south of Sydney at the end of the M1 Princes Mototorway. 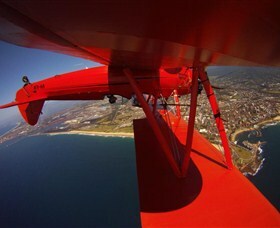 The Illawarra region is the perfect environment in which to learn to fly. The stunning scenery, beaches, Lake Illawarra and the escarpment as a backdrop are some of the most beautiful views in Australia. 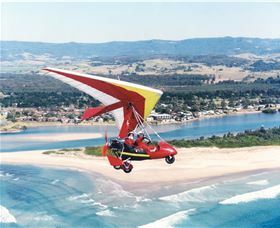 They usually fly out over Lake Illawarra, down the coast past all the fantastic beaches towards Kiama then back through the Jamberoo Valley if conditions and time allow. Alternatively, out to the coast and then northwards following the beaches, towards Wollongong and return. Either way, there is no better aircraft for sightseeing than the microlight. Flights last about 36 - 40 minutes. They provide helmets, headset and intercom. Bring a warm jacket and gloves, in case the day turns cold. The Berkeley Hotel is your entertainment and social hub in Berkeley. It has an authentic Thai restaurant called Stamp Thai. Come and enjoy the exceptional food. Open for lunch and dinner with daily lunch specials. There is a large TAB and Sports Bar, and lounge area to enjoy socialising with family and friends. The Berkeley Hotel is determined to meet the needs of you, their customer and provide the highest quality service. C1 Speed is an Australian first, an ecological system of electric indoor karts that covers an area of 3,000 square metres. A style characterised by 'techno' and futuristic content that makes it unique among its kind. A true jewel in the karting industry, the new multipurpose motorsport centre is noted for its spectacular circuit, designed with more than 400 metres of straights, chicanes and curves, inserted into a structure where you can experience the thrill of driving on the track. The fleet consists of 40 current generation electric karts, much safer than petrol karts and they perform much better than traditional petrol engines. The indoor go kart racing speedway is open to the general public seven days a week when not reserved for a private event. 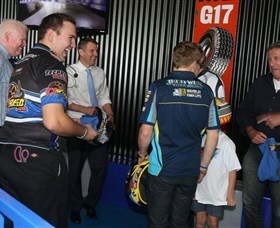 Whether you want to race against the clock or race against a friend there are many kart racing options to choose from. Rated as one of the best layouts on the South Coast, Port Kembla Golf Course is an 18-hole championship par 72 course which has hosted many professional tournaments as well as the NSW Champion of Champions. Perfectly maintained all year round, the course is a challenging blend of tree lined fairways and strategic water carries, sure to excite any golfer. Warm up on the driving range, practice chipping and putting on the practice green, or fine tune your swing with a lesson from their resident professional. 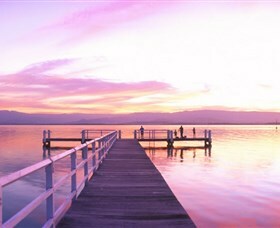 Lake Illawarra is located between the Illawarra escarpment and the Pacific Ocean on the NSW South Coast some 90 kilometres south of Sydney. Water flowing into it is both fresh (from the escarpment) and salty (from ocean tides). The Lake is approximately 9.5 kilometres long and 5.5 kilometres wide, with an area of 33 square kilometres and a maximum depth of 3.7 metres. 13 boat ramps surround the lake and is a popular recreational location. The lake is a popular spot for fishing, prawning, and all water sports. There is a boat and catamaran hire close by as well as several caravan parks. There is also a shared pathway that can be enjoyed by all. 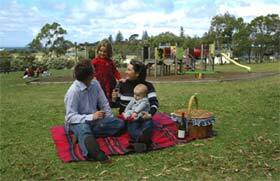 Reddall Reserve on the foreshore of Lake Illawarra is a popular spot for picnics with its children's playground, amenities and kiosk. Windang Beach is located at the entrance to Lake Illawarra, 15 kilometres south of Wollongong's city centre. 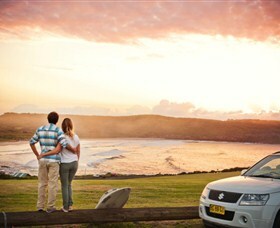 It offers spectacular views of the famous Five Islands off the Wollongong coastline. The beach is very popular with families and there is accommodation nearby at the local caravan park, which has views of the lake and the ocean. There is a large park at Windang Beach with barbecues, sheltered picnic areas, a playground, and a cycle path. Windang Beach and Lake Illawarra are good fishing areas. Dogs are banned on Windang Beach however to the north the middle area of the beach is a dog friendly off lead area. Please view Wollongong council dog zoning areas for clarity. 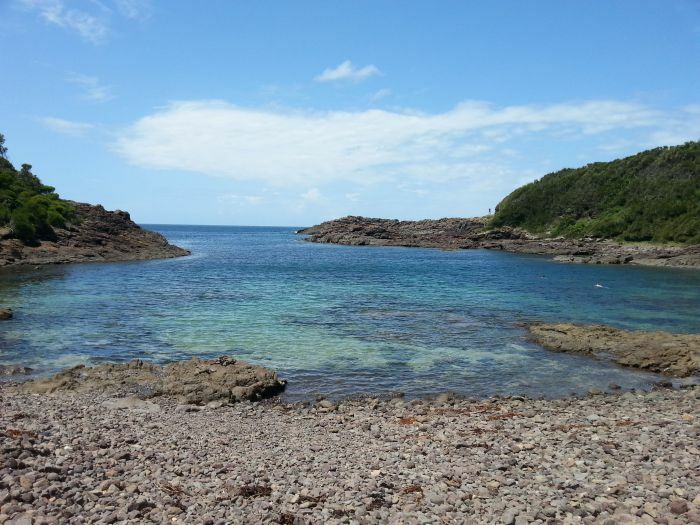 One of the most popular beaches in Shellharbour City is Shellharbour Beach. This clean sandy beach is patrolled during the summer months on the northern and southern ends. Facilities include showers, public amenities and parking. Shellharbour North Beach is an east facing one kilometre long beach, lying between Barrack Point and the rocks at the base of the ridge on which Shellharbour Village. The beach is backed by a low vegetated fore dune, with a road behind. The Shellharbour Surf Club is located here and offers surf club facilities. A Beach Wheelchair is provided at Shellharbour North beach for people with a disability or mobility impairment. Killalea State Recreation Park is a spectacular tract of coastal land that has been dedicated as a public recreation reserve available for surfing, fishing, picnics, bushwalking and camping. The park also has bunk house accommodation for groups. Killalea has two favourite surf beaches, Killalea Beach or 'The Farm' as the locals know it and Minnamurra Beach 'Mystics'. 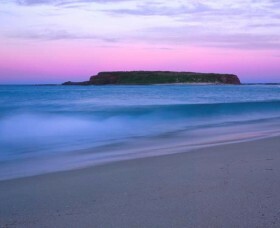 In 2009 Killalea State Park was named a National Surfing Reserve with the vision of saving this unique surf break for future generations. The Farm is quite unique as it faces south east and and has a point break that has fairly consistent surf. Surfing lessons are available from here - contact the Shellharbour Visitors Centre for information. The park has a camping facility with 50 unpowered sites available and bunkhouse accommodation for groups. The park also has a kiosk on site. The state park features 250 hectares of pristine coastal reserve with excellent surfing beaches. It features stunning views in all directions, and a range of public recreation facilities consistent with environmental conservation. 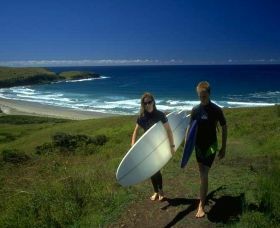 The popular Killalea Beach known as 'The Farm' is famous with surfers throughout the region. It was declared a national surfing reserve in June 2009. The beaches are not patrolled, however, there are beautifully landscaped picnic areas located in the park with barbecues and public amenities for the family to enjoy. The park also features bush and coastal walking trails, and is within hiking distance of Bass Point Reserve and Shellharbour Village. Popular recreational activities include: Surfing, Fishing (from rock, beach and river), Picnics at several sites throughout the park. There is also camping areas with undercover barbecue area or the backpacker style bunkhouse for 40 people. There is a kiosk within the park. Located just three kilometres north of Kiama at the southern end of Jones Beach, this distinctive rock formation is part of the geologically fascinating coastline. Cathedral Rocks, has lured sightseers since 1890. These volcanic rocks, while intensely hard, have many joints. These joints have been eroded for many years, leaving these mysterious rock formations. The rocks may be viewed from Cliff Drive or studied from close range by approaching from the north. These rocks are a photographer's delight! Definitely worth a visit! We ARE the POINT OF DIFFERENCE to what you can get online and over the phone! We are REAL people with REAL experience. For many years we have been creating and selling holidays to the local families in the Illawarra and South Coast of New South Wales. We care about you, your family and friends.